It’s been almost a year since I last posted here on my blog and over two years since I introduced IdPinThat.com to you fine folks…it’s been a busy few years..but I’m happy to say, IdPinThat is here to stay and version 2.0 is live now! With version 2.0 comes everything anyone ever asked for in the product, and everything I wanted to have since day one, plus a few things I hadn’t even thought of including a team powering development going forward! What feature are you most excited about? Tell me in the comments! This is something I always wanted to have and those I spoke to about this feature agreed that they would like to be able to log into IdPinThat and retrieve pictures previously designed. Now that is possible! You can log in now with Facebook or Google and save every image you click as well as every image you edit right to your account. You can access that history by clicking on ‘My Pictures’ and once there, can download images or re-edit them from where you left off. Probably the most asked for feature since launch has been the ability to upload your own pictures. Now that is available for registered users! Upload your own pictures and they will appear in your ‘My Pictures’ page where you can download or edit them. For mobile users, you can upload or snap a new picture and it’ll open up right in the editor on IdPinThat! We have added two new image sources to IdPinthat including Unsplash and PEXELS. These image sources bring a whole new level of image quality without any change to image licensing. All Pictures on IdPinThat are CC0, Public Domain, and you can use them in any way you like including commercial use. Try a few searches and see what kind of results you get now 🙂 I know you’ll be happy about having more, high quality picture choices. Also, if you’re looking to get something prototyped or built and care about quality, we are the team for you. You can reach me here to learn more about the team’s background and areas of expertise. The ability to watermark images has been on the list for a while but it has to be done right to be worth doing. Currently we’re talking about allowing users to upload their logo and have it automatically superimposed on all images they create in a fixed position. It will be great for branding. Public and Private streams. Currently, everything you do on IdPinThat is private to you, but it would be cool to be able to publish images you create to a public stream that others can access and use to create their own images with. More login options including Pinterest and Twitter, with the ability to automatically post to your social profiles. WordPress integration through a plugin that would allow you to search IdPinThat from within your blog, edit, and save images directly to your WordPress media storage. This would allow you to publish great images in posts quicker. A dedicated memes page with templates for all the popular memes, so you can choose your meme, add your text, and send it out into the world. User Preferences! With user accounts, we can now let you guys customize your experience. Things like giving you the ability to choose what sources you search through, what sizes or orientation of images you’re looking for, and what license types you want to use, should you choose to deviate from the Public Domain license that we default to and encourage on IdPinThat. That will soon be your choice. We’ll also continue to integrate with more image sources to give you the best experience possible when you need a great picture in a hurry. Please check out the latest update and let me know what you think. 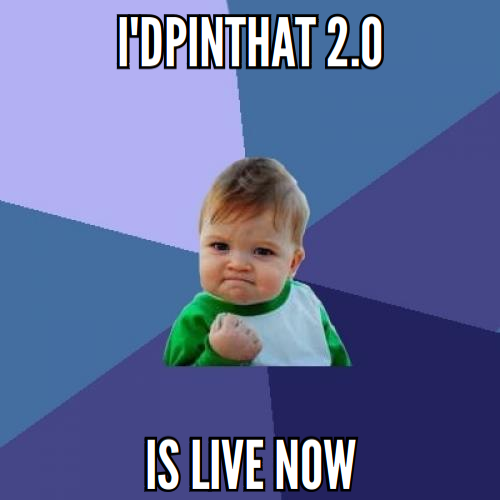 If you bailed on IdPinThat v1.0 for whatever reason, give it another shot, I’m confident you’ll find value in it. And Thank you, especially to those that continue to use IdPinThat every day. I appreciate the support and would not have spent time developing new features if it weren’t for you loyal users.